Sunderland Harriers' Paul Blakey, who is an Over-45 contender. 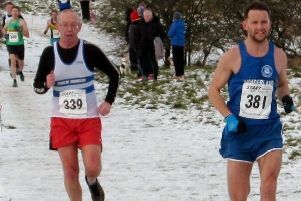 Sunderland Harriers and Sunderland Strollers have a good few athletes entered that have medal potential in the North East Masters’ Cross Country Championships at Wallsend on Saturday. At the Masters’ Championship at Darlington last year, Sunderland Harriers won two men’s team titles and one women’s Over-35 title. All their seven man squad came away with at least one medal. But that performance will be hard to match this time. Sunderland Harrier Michael Barker makes his Masters’ debut and he should be in with a chance of a medal in the M35 category, with Sunderland Stroller Mark Anderson also a contender. The race favourite will be Gateshead Harrier Conrad Franks. Sunderland Harriers’ Over-45 Paul Blakey, Over-50 Tim Field and Micky Thompson plus Over-60 Paul Merrison are all medal prospects. The club’s women’s team of Vikki Cotton, Vicky Haswell and Nikki Woodward have an Over-35 team medal chance. Sunderland Strollers have Wendy Chapman making her debut as an Over-50 and she will be the favourite in her new age group. Over-55 Dawn Elliott and Over-60 Lyne Valentine will also fancy their chances in their age groups. The leading women entered are Morpeth’s Jane Hodgson and Gemma Floyd, plus Over-40 Durham City athlete and Scottish international Joasia Zakrzewski. Four-time Over-35 winner Sunderland Harrier Kevin Jeffress will not be going for his fifth title, as he will be competing in the Torremolinos Half Marathon on Sunday. Jeffress said: “I was looking for a race to see where I’m at as regards my London Marathon training. “After a good solid winters cross country training of 90+miles a week and a good training plan from my coach Glenn Forster, I thought a half marathon would be good indicator of fitness. “Also, it’s a bit of a break for few days before I start my 12 week specific marathon build up. “I came across the Torremolinos half and thought it would factor in well, never realising until last month that it was same weekend as North East Masters. Time table: Race 1: 12.30pm - Women and Men Over-65 3.5m approx (two laps). Race 2: 1.15pm - Men Over-35-64. 5.25m approx (three laps). Parking is at Beacon Hill School and on road at side of course. No parking inside sports ground. 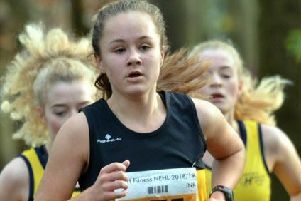 Houghton Harriers have been rewarded through their fine performances in the Northern Cross Country Championships with a number of their young athletes being selected for the North East Inter Counties team. A total of seven athletes will be on the team coach for the Inter Counties Championships at Loughborough on Saturday, March 9, after catching the selectors’ eye at Pontefract last Saturday. Teams of eight are selected with four reserves in the younger age groups. Under-17 Will Bellamy was pre-selected after finishing in the first three in the North East Championships in December at Wrekenton. Henry Johnson, the Durham Schools champion, joins his clubmate. Houghton have three athletes selected in the Under-17 Women’s team, with Eva Hardie, Lydia James and Anna Pigford. Brandon Pye has got the nod for the Under-13 team for his consistent form throughout the season and finishing sixth in the Northern Championships. Amy Leonard makes the Under-15 team and Nicole Philips is down as a reserve. Sunderland Harriers have three athletes in the Under-20 Women’s team with Sarah Knight, Eve Quinn and Hayley Dobinson. Alice Smith gets a reserve spot in the senior women’s team. The senior women’s team is: Georgia Campbell (Jarrow and Hebburn), Emma Holt (Morpeth), Danielle Smythe (Heaton), Kate Avery (Shildon), Sonia Samuels (Sale), Danielle Hodgkinson (Wallsend), Rachel Lundgren (Hallamshire), Catriona Macdonald (Morpeth) and Helen Warburton (Gosforth). Senior men: Greg Jayasuriya (Midd and Cleve), Kieran Walker (Midd Athletics Club), Jack Willis (Midd and Cleve), Calum Johnson (Gateshead), Phil Wylie (Cheltenham), Carl Avery (Morpeth), Carl Smith (Tyne Bridge), Adrian Bailes (Birtley), Dan Jenkin (Durham). The Inter County Schools’ Cross Country Championships will be held at Temple Park, South Shields, on Saturday from 12-3pm.